Leverage is really just another word for ‘doing more with less‘. Leverage is the idea of getting an advantage by using a lever to lift or move something that you wouldn’t be able to otherwise. In our use of the word, leverage is about lifting your well-being by using your energies and resources in ways that are more focused and effective. It is really about leveraging the positive, vital things in our lives and eliminating the negative, trivial things. 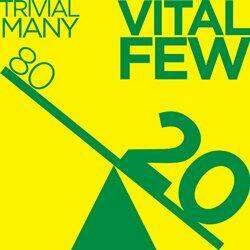 The 80:20 principle is an extremely useful way of thinking about the vital few things that matter the most. The Principle predicts that in many situations a majority of effects are due to a minority of causes. The actual figure varies considerably from case to case, but a ratio of 80:20 is about average and quite common. You use 80% of your stuff only 20% of the time! What are the vital few things in my life that provide the most well-being? How can I focus my energy and attention on those vital things that make me happier and my life a richer experience? How can I reduce the energy I put into activities that do not bring as much value? How can I eliminate the trivial things that can have a negatively effect on my experience?